Cabbage is a multi-layered vegetable, grown for its dense-leaved head. 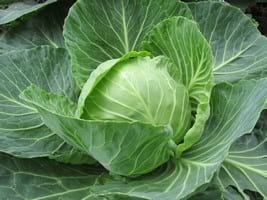 Within the cabbage family, there are three main cultivar groups: savoy cabbage, red cabbage, and white cabbage. Do Rabbits Eat Cabbage Leaves? Although they qualify as leafy greens, cabbages should not be continuously fed to your rabbit. The reason for this is that studies have shown that feeding rabbits daily rations of cabbage can cause enlargement of the thyroid. This is a large ductless gland in the neck which secretes hormones that regulate growth and development. However, with normal feeding in which leafy greens are regularly rotated, there is no cause for concern in feeding this nutritious food. We also came across some accounts that mention cabbage might cause gas with rabbits. This assumption is probably based on the fact that people often get gas from cruciferous vegetables like cabbage. We were not able to find scientific evidence to support this statement in the case of rabbits. Actually, it is foods that are high in starch and sugars that are more likely to throw off a rabbit’s gastrointestinal tract. Also, some rabbits will be more sensitive to certain vegetables than others. Based on the above, we advise to include cabbage in your rabbits diet. Just make sure to regulary rotate. If it’s the first time, introduce in small amounts and rinse before offering. Conclusion: this was a tricky one, rabbits can eat cabbage leaves but remember to alternate with other greens. Does your bunny eat cabbage? Let us know your experience in the comment section below.